How Does Pine Straw Affect the Acidity of the Soil? An urban legend among gardeners is that soil beneath a pine tree is too acidic to sustain plant life, and using pine needles as a mulching agent will only acidify the soil. However, pine needles, though slightly acidic in their raw state, have no more effect on soil acidity than does normal rainwater. In addition, when aged and dried, pine needle mulch, known as pine straw, makes a more effective mulching agent than conventional wood chip mulches. Pine trees, like many coniferous trees, are heavy feeders. Because of their extensive root systems and feeding needs, they tend to rob neighboring plants of sun, nutrients and water. Plants that survive under conifers have more superficial root systems, grow well in shade and are light feeders. 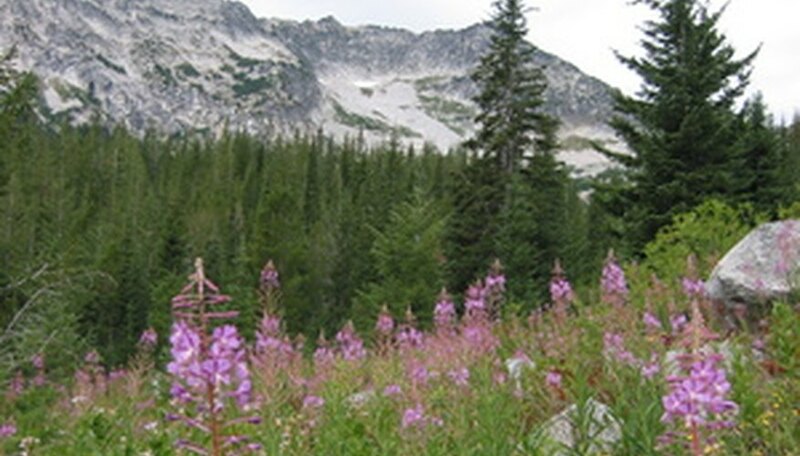 Wild strawberries, hostas, lily-of-the-valley, and flowers like azaleas and mums do well under and around pine trees. Though gardening centers may steer you toward flowers that grow well in acidic conditions, keep in mind that the layer of fallen pine needles, though slightly acidic in a fresh state, will rapidly lose their acidic pH within a few weeks, especially if exposed to rainwater. Normal rainwater, also slightly acidic, acts as a leaching agent on pine straw. Types and composite of pine straw vary regionally, but generally fall into three classifications: longleaf, slash and loblolly pine straw. Longleaf, the desirable and durable, has a long, thick needle averaging 14 inches with a heavy wax coating. It's more scarce than the other two groups and pricey. Because of its durable nature, and its ability to withstand harsh environmental conditions, the U.S. Forest Service is stepping up efforts to expand longleaf conifers. Slash pine straw, because of its durable nature, cleanliness and affordability, is the most popular category of pine straw. 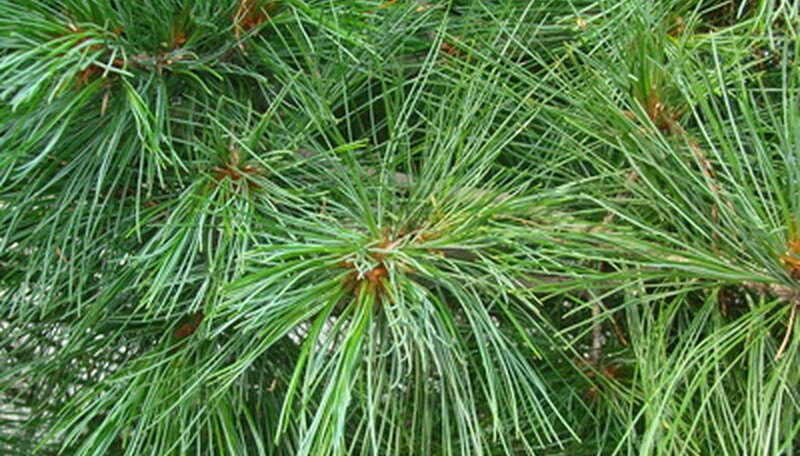 Needles average 9 inches and most commonly come from the yellow slash pine. Loblolly, or short-needle pine (Pinus taeda) is the least durable of all the pine straw and the cheapest. Pine needles, averaging 6 inches or less, are usually poor quality, have broken pieces, dirt or debris and are aesthetically less eye appealing. As an acidifying soil supplement, pine straw is not the best choice. First, all conifers are not equally acidic, and even fresh pine needles are acidic only until exposed to the elements. Second, pine needles or pine straw make excellent mulch because they decomposes slowly. A good soil supplement must integrate well with soil in order to affect the pH. If you wish to lower the alkaline nature of your soil, look for quality compost that tends to be more acidic or acidic peat moss. Pine straw, as a mulching agent, is more effective at suffocating weeds and restricting seeds from germinating. Once properly laid in beds, it doesn't blow or wash away. Because it decomposes slowly, the need to refresh pine straw is less than with wood chip mulches. In terms of a water filtration layer, it allows water to penetrate into the soil, prevents water runoff and because it effectively aerates, depresses mold and fungal growth. Pine straw is a natural byproduct of conifers that lose their pine needles. Unlike traditional wood chip mulches that require the chopping down and grinding whole trees, pine straw is a renewable resource that provides nutrients to the environment without harming it. Pine Straw Info: What Is Pine Straw Mulch?